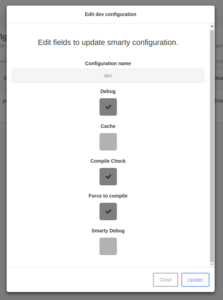 Smarty cleanly separates your presentation HTML/CSS from your application PHP code, so you have the configuration list for each smarty engine template environment and you can edit them. You can perform actions on each configuration like debug, cache, compile check or force to compile. To confirm you just need to click on update.